The Nanosight nanoparticle measurement system from Particle & Surface Sciences provides both a direct, real time view of nanoparticles and comprehensive particle-by-particle size distribution analysis. The LM10 Nanosight nanoparticle measurement system is proven with most nanoparticle classes, down to 10nm, and dispersed in a wide range of solvents. The system comprises a viewing unit, matched camera and microscope together with a computer control unit. particles in fuels and oils (soot, catalyst and wax). Enhanced by a near-perfect black background, LM10 nanoparticle measurement devices use a laser light source to illuminate nano-scale particles, with particles appearing individually as point-scatterers, moving under Brownian motion. The system can instantly recognise polydisperse and multimodal systems, as well as agglomerates and contaminants. 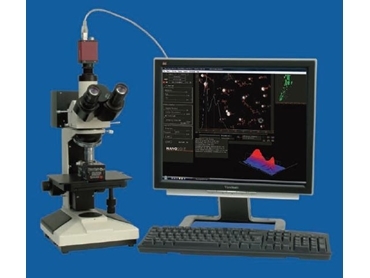 The NTA image analysis software suite is included with these nanoparticle measurement systems, allowing the user to automatically track and size nanoparticles on an individual basis. Results are displayed as a frequency size distribution graph, and output to a spreadsheet. Video clips of images are recorded and retained. full reporting and batch processing facilities. A sample size of 500µl of suitable viewing concentration is required to begin particle analysis, and is introduced into the viewing unit with a disposable syringe. A view of particles in motion is presented to the user directly. The NTA image analysis software then rapidly determines the particle size. an information-rich view of particles in motion. sizing directly from individual analyses of many particles. No disposables and significantly lower purchase cost. Nanosight nanoparticle measurement devices adopt an absolute method of particle analysis, so no calibration or refractive index data is required. NanoSight works continuously in product development, so specifications are liable to change.